Bring on the cold weather, I'm ready. This coat is so warm! It's the perfect thing to brighten up a grey day. Also to me this qualifies as a neutral - since it is a solid color and can go with so many other solids or dark color outfits. 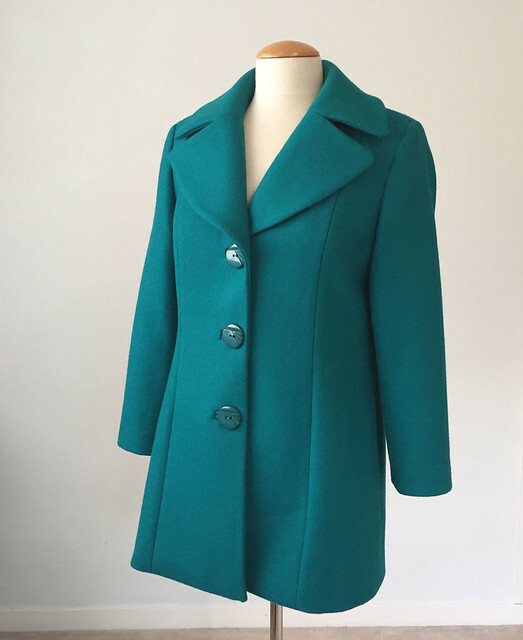 This will be another long post, to go with part one of making this coat. For those of you who like the sewing details - settle in. 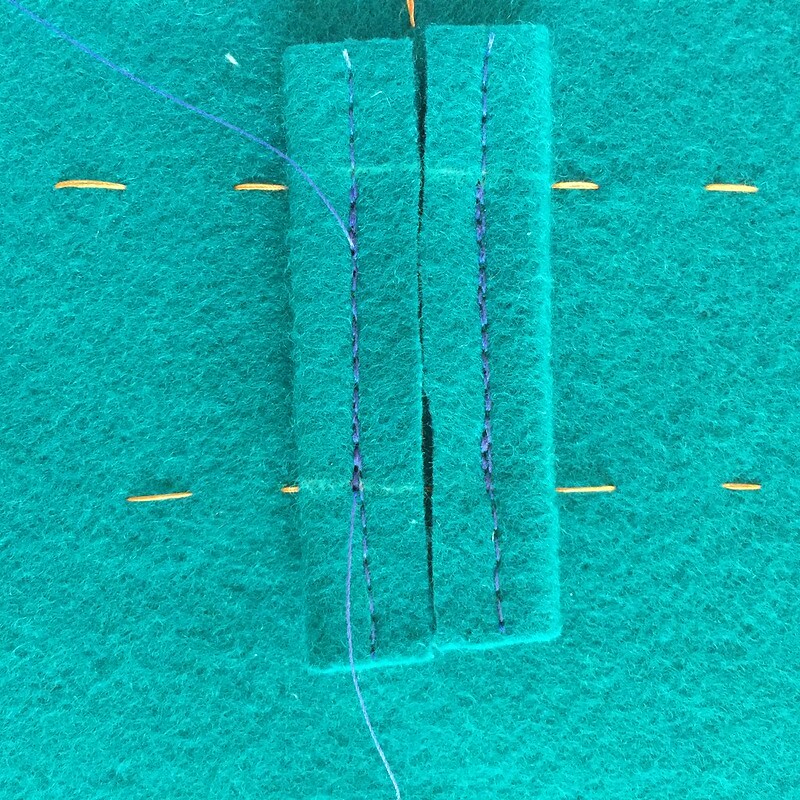 When I left off the previous post, the bound buttonholes were completed. As I have said in other posts, once I get bound buttonholes done with no mishaps I always feel that any project is downhill from there. 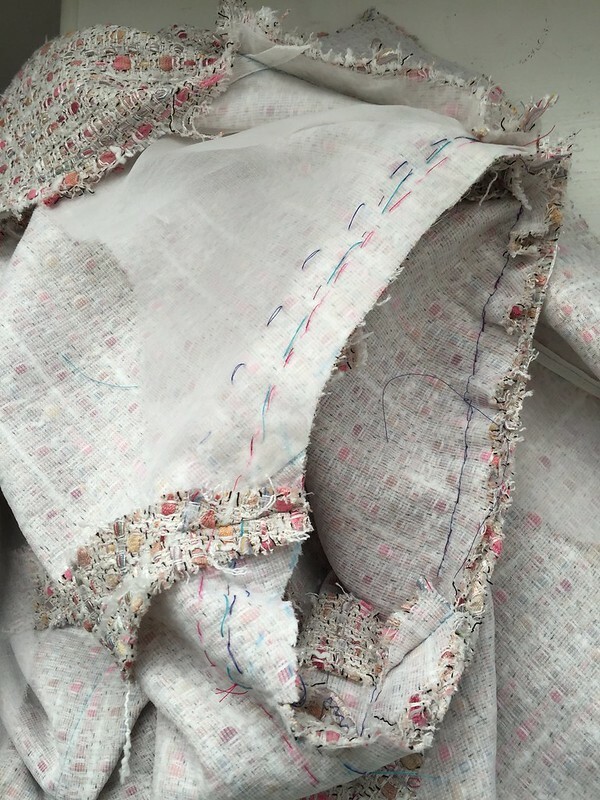 Now let's talk interfacing. And if I had a sewing motto it would be "more interfacing". 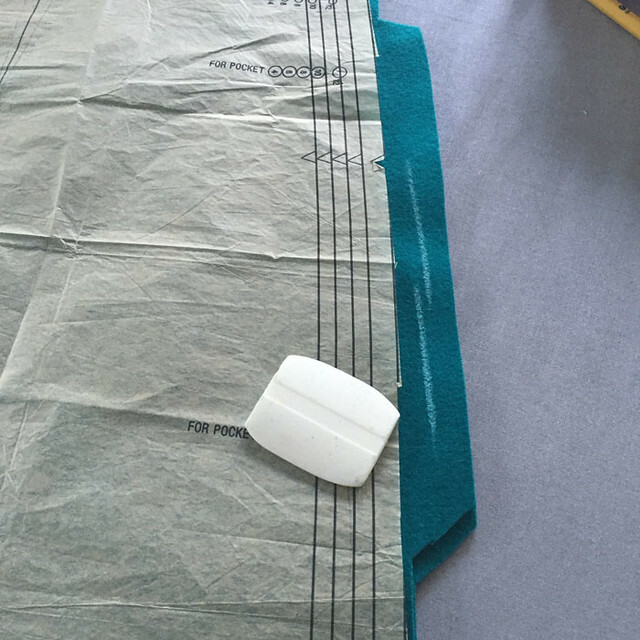 Most sewing patterns or books give general info on using interfacing but I pretty much use it on every part of the lapel, collars, facings, pockets, hem, sleeves and other spots that might need some support or stabilization. Here's the collar, where I have determined the roll line and added extra interfacing to get it to roll over properly. 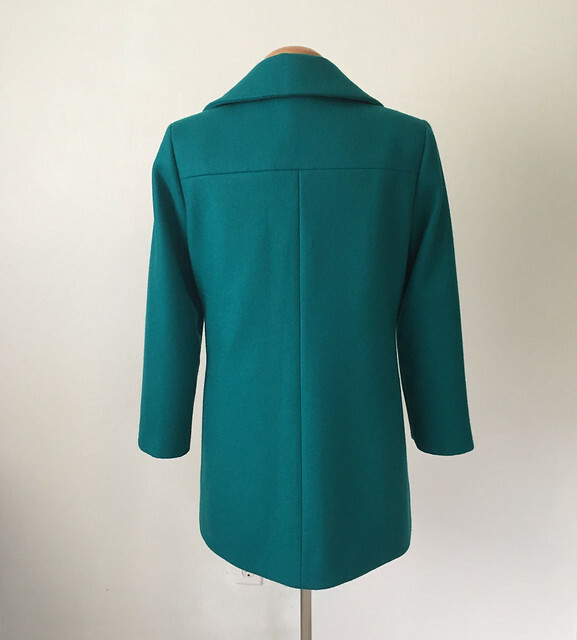 To review, I am using Simplicity 2311 which is a really great coat pattern and one which I previously used to make a black full-length wool coat, first post for that coat here where you can see I figured out where the collar roll line was on the muslin. Now for my repeated refrain: why don't pattern companies include this as they used to? See older Vogue patterns - it was there. 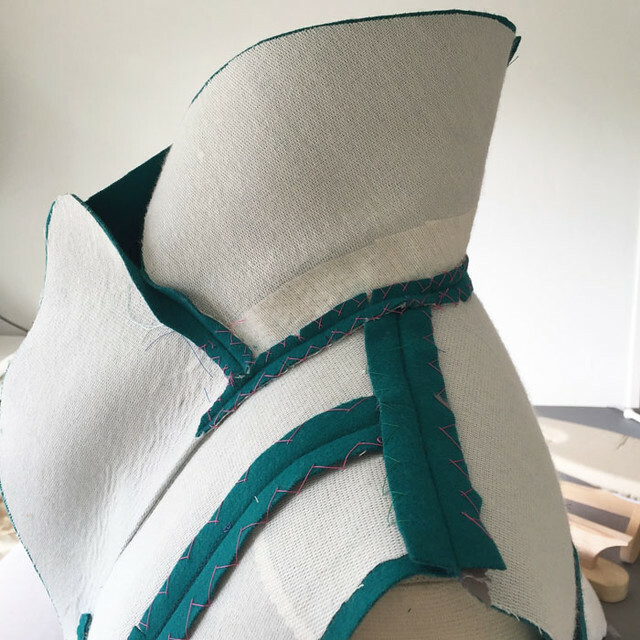 Using a double layer of interfacing to support the bottom part of the collar stands in for doing the hair canvas and pad stitching method. Then I pinned the under collar on my tailor's ham and steamed it in place, then left it to cool and dry with the crease. Next up, stitching the undercollar to the jacket. I do it in sections, stopping at the junction (typically the large dot) where the back neckline and lapel meet. Note that most of the seams are catch-stitched down after pressing. 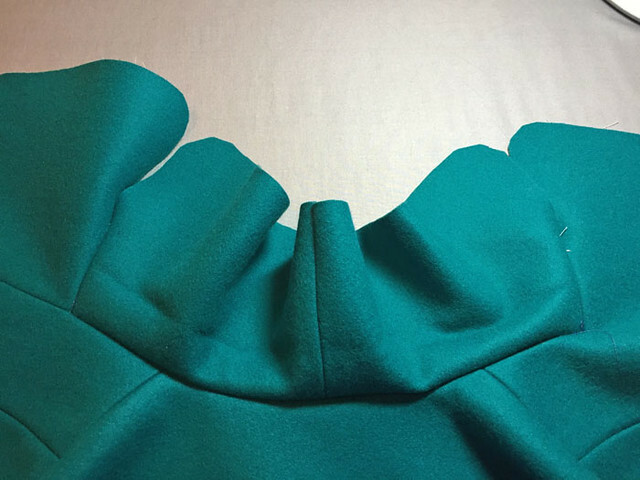 To me that makes such a difference for the inside of the garment, and thus the outside, keeping the seam allowances from moving around and keeping everything flat on the outside. Here is that seam before pressing. You can really see how the under collar will fold over nicely due to shaping the roll line. Next up, pressing and trimming that seam, and then catch-stitching it down as well. 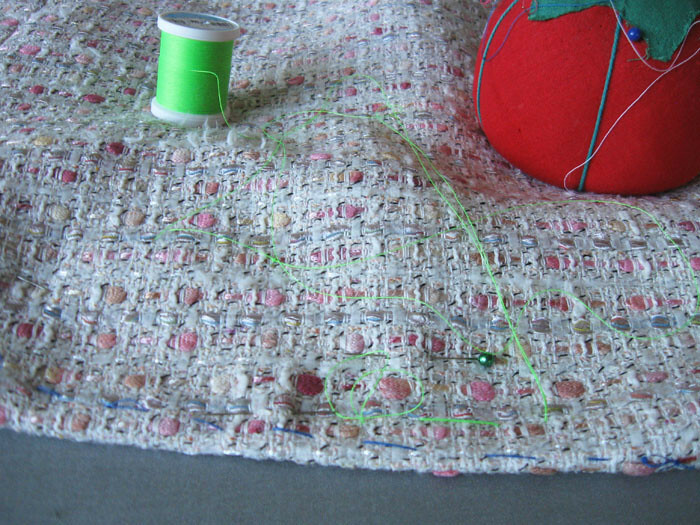 Using silk thread, and only stitching it to the interfacing so it is quite easy to do and a worthwhile step. 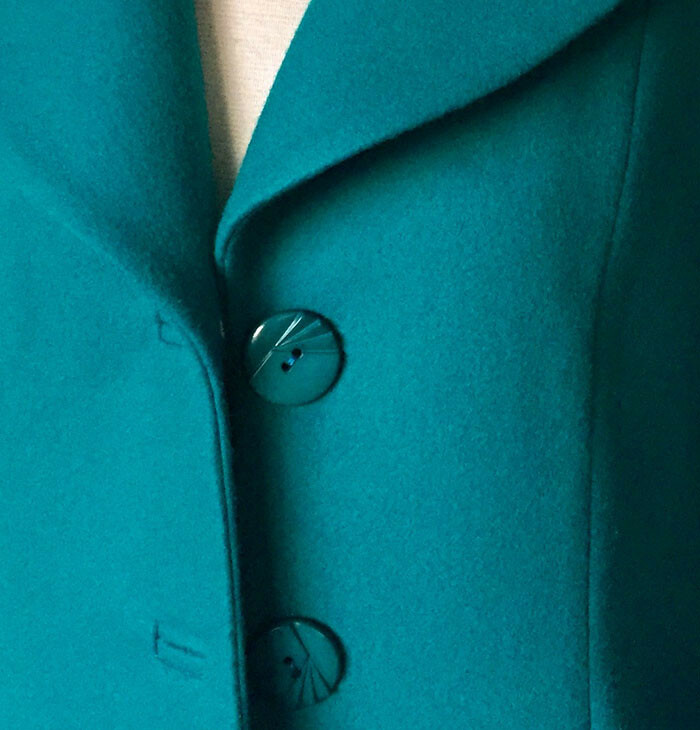 I like how this pattern has a dart that creates the inside lapel corner on the coat front. I have a Vogue jacket sewn a few times (used in my jacket series starting here) with that same dart feature. 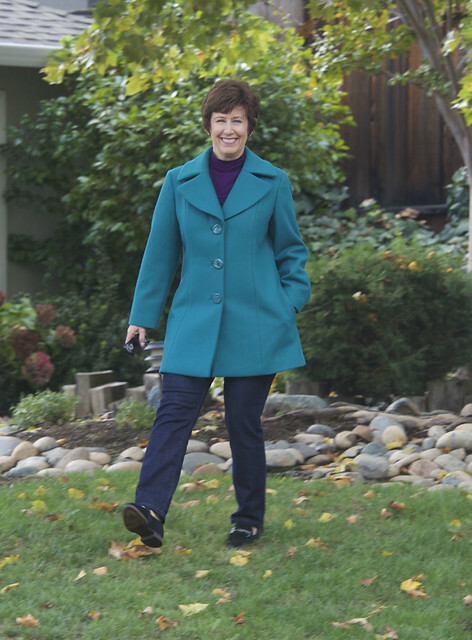 It gives a nice feminine shape to the jacket front without a side bust dart. Now to one of my favorite parts - trimming. And so important! Anything with a scissors I find so enjoyable (cutting fabric, cutting my garden roses, cutting my hair - ok - that last one is much to the dismay of my stylist) Everyone has some little sewing task that they find gives them pleasure - I just like snipping and trimming. 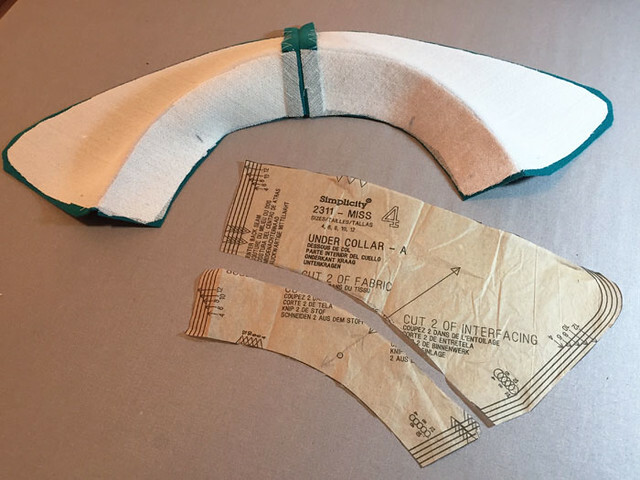 And then for the corner curves, on this think fabric it is entirely necessary to cut the triangle wedges out of the fabric so that when the corner is flipped they squeeze back together and don't leave any lumps or ripples. I think this takes a little bit of practice and ability to gauge how the fabric behaves. You don't want a saw-tooth effect showing through but you also want to remove the extra bulk. I took this picture to show one lapel all trimmed but as yet unpressed on the outside, juxtaposed with the trimmed inside lapel. I didn't take a picture of one crucial step which is to press the seam allowance open. However if you look at my jacket series (I will list links below) you can see what I mean. That's it for construction photos on this project - here is the coat on the dress form. I'm not entirely sure about the length - maybe it could have been a bit shorter - more like a jacket but this will do, and I'm not changing it now. 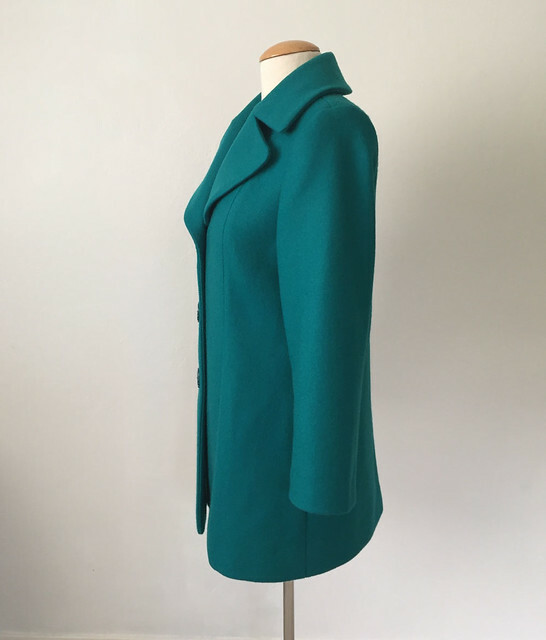 When I made the first version of this coat, in black wool I thought it was a bit boxy so I put long vertical waist darts in the back for shaping. They really don't show in that fabric. For this version I wanted a more boxy peacoat style so left them off. Slightly cartoony facial expression here - but you can see the length and shape. Oh yeah, another inside detail. I put deep patch pockets on either side of the front. I actually got out my wallet, sunglasses, cell phone etc and decided on how big I could make these while not distorting the front of the coat. Success! I stuffed so much in these pockets when I was in New York. Sunglasses, wristlet wallet, scarf, cash. Very handy and so great not to carry a big purse. I was kind of rushing to finish this coat before that trip, a little velcro or even a lightweight zipper at the top would make them even better. The front lawn is greening up after our super dry summer - this rain lately is so welcome although taking these photos the temp was near 70˚. Not exactly wool coat weather but at least the leaves are beginning to fall. I am so happy with these buttons, could the color be any more perfect? I got them at Stone Mountain in Berkeley. Also bought the lining there too, ambiance rayon in the perfect shade. They have the best selection of lining in every color. Initially I was planning to put gold buttons - but I think these look just right. Not quite succeeding at the "so cool I have to wear shades" look. But ready for the weather to get chilly so I can wear this coat some more. Here are a few links for things I mentioned in this post or might be of interest. This post has some info on that front hem corner. 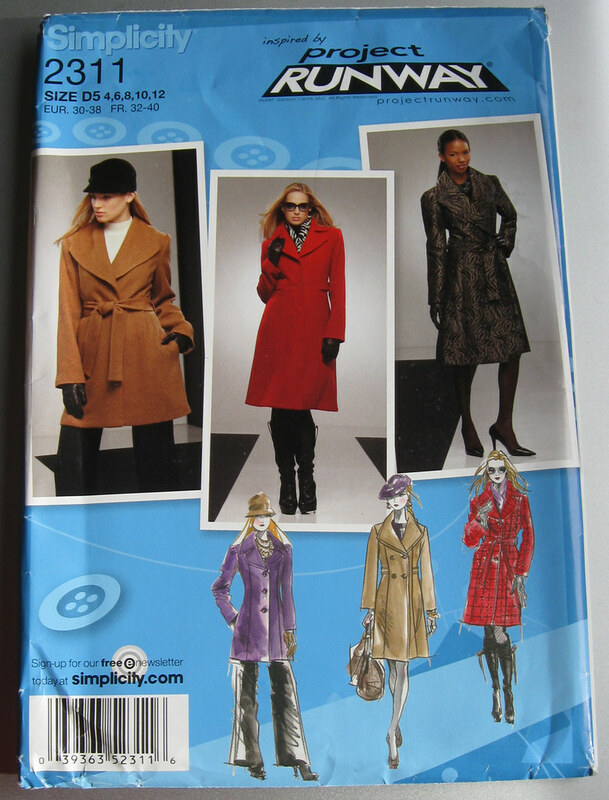 I highly recommend this Simplicity pattern (2311) which finally appears to be OOP, however there seem to be lots of copies available on eBay. 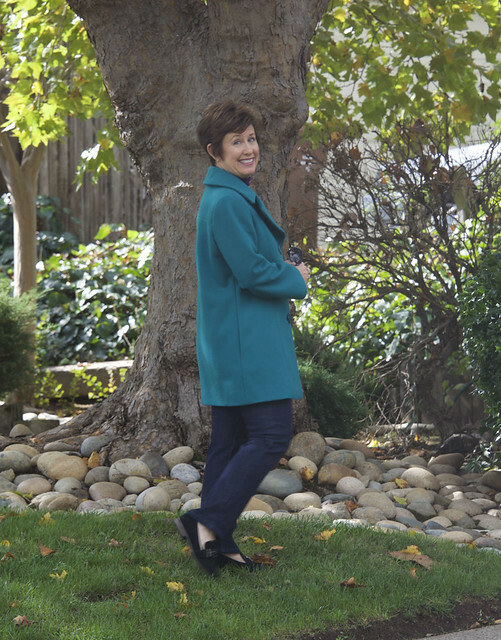 It is an easy pattern to sew and the proportions are great for a warm winter coat. That's it for coats for Fall 2016 - Winter 2017. So I say, ha ha. OK, no more coats - but jackets, yes. I just opened Vogue 1526 earlier today for a quick look. I might recreate the same version as is on the pattern envelope, since I bought a red wool at Metro Textiles in NY that would be perfect. It looks quick to sew, with no sleeves and in seam buttonholes. Like I said, we just need some wintery weather to wear these things. In other projects, I am playing around with pattern adaption to make a tie neck blouse. I don't see the need to buy a pattern for that and I love manipulating shirt patterns to create different looks. Also I have a Random Threads post in the works and feel a Pattern Whisperer post coming on. Pondering a couple of different topics - party dresses are a perpetually popular category but what about party blouses? Meaning a blouse in a dressy fabric - something not for work but for wearing to a party or evening out - with pants (warmer and more comfy) plus quicker to sew. 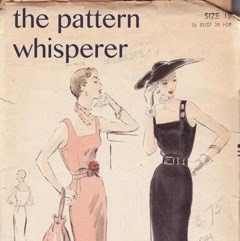 Chime in on your requests for the Pattern Whisperer category. 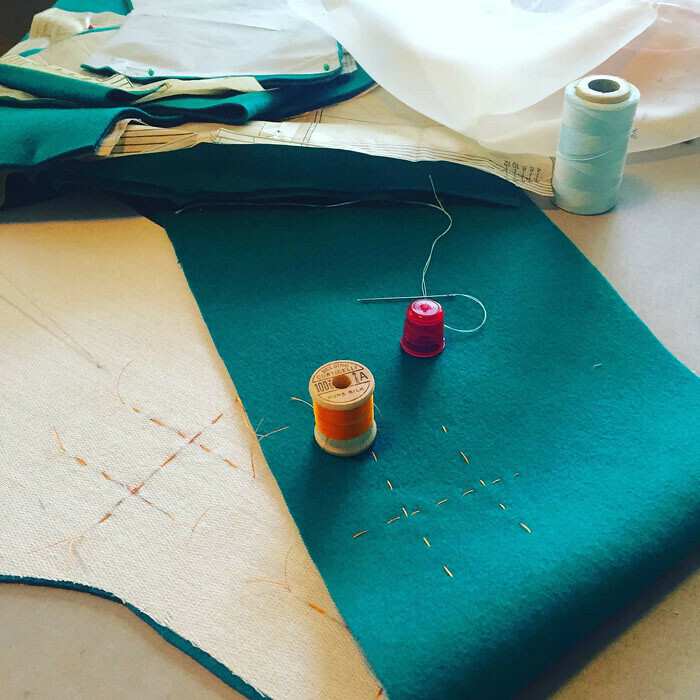 The holidays are fast approaching and we need to get sewing for upcoming festivities. It's supposed to rain here Monday evening which would be the first in a long time - Soggy trick or treaters plus a week night has me hoping it will all be wrapped up by 8pm or so. We can hope. 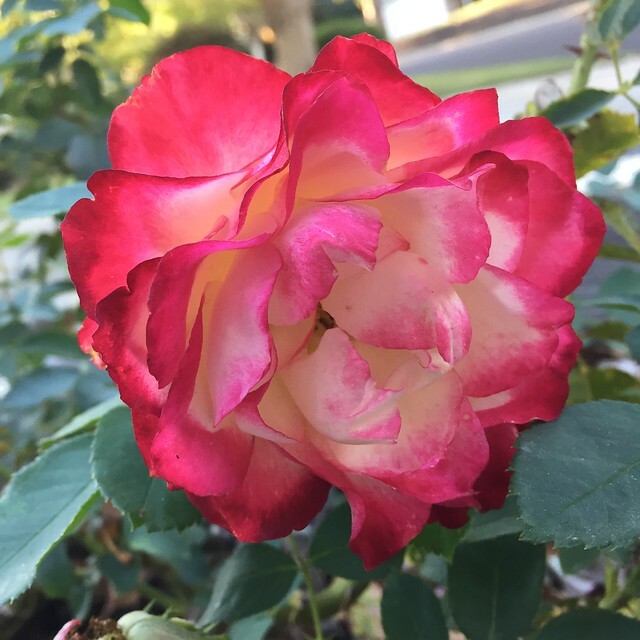 today's garden photo, which I took some weeks ago when the hydrangeas were starting to turn dry and autumnal, but a few roses were still blooming. My latest coat adventure started when I was reorganizing my fabric stash. I always say I don't really have that much fabric accumulated - but what I do have is starting to spill out of the shelves where it should reside and threatening to take over the spare bedroom. Yes, it is my guest bedroom, although if I have a guest I then have to do some serious tidying to expose the actual bed. Because it is so convenient to toss any new purchase or accumulation on top of the bed - for a future time when I will put it away. Ha! Who wants to put things away neatly when there are better ways to spend my time? Like actually sewing, or being outside enjoying our seemingly endless summer weather, or just about anything else. So after a good look at the accumulation, and knowing I was going to New York with the high likelihood that I would buy some fabric there, I decided to see what exactly was taking up space. You know what takes up a lot of space? Wool coating fabric. No matter how you fold that stuff it is bulky. And I still had a large piece of this green wool coating - previous used in part on my Tri-Color Coat. This realization combined with a Burda pattern release where I fell hard for the idea of a peacoat. 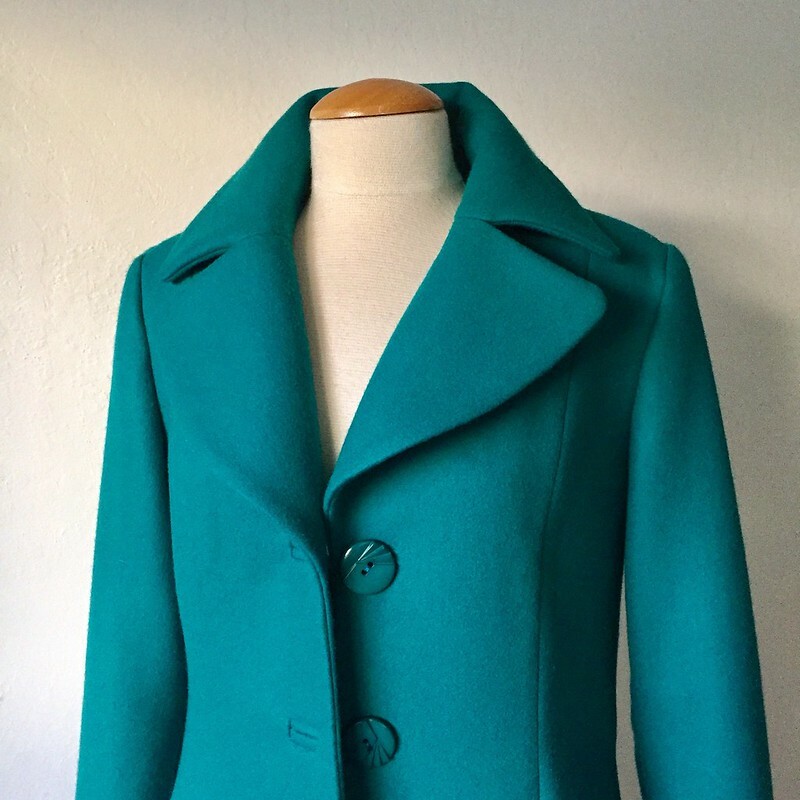 Here's the Burda pattern that grabbed me, Burda Detachable Fur Collar Coat 10/2016 # 119. So I promptly purchased that downloadable PDF from their website and got to work making a muslin. Which was OK, but just not quite my thing. I did like the welt pockets that give it a casual peacoat look, and the lapels, while large are proportional and just right for this style. But I am just not a fan of double breasted coats. In theory I like them, they look so sharp and stylish, but wearing, I always feel like there is too much fabric, particularly when it is not buttoned. Also this coat has a princess seam side panel, so no actual side seam and that makes fitting just a little bit more work. Anyway - I was looking at it on my dress form and though, hmmmmm, very similar to another pattern I have already made - which fits perfectly - my black wool coat. Which I made at the end of 2010. It pays to keep good patterns! 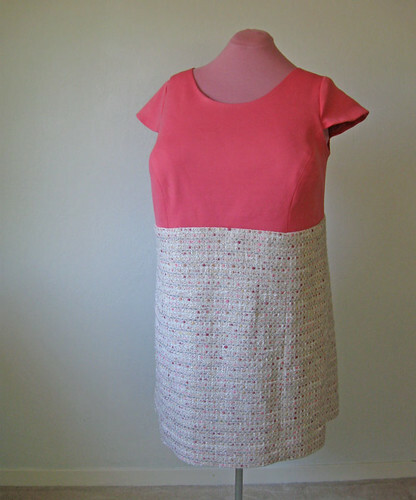 Here's the pattern I used, Simplicity 2311. I mentioned this pattern on Instagram a while ago saying that it was discontinued, but Simplicity commented that it was still available. I think it is a really good pattern. with a lot of options in the envelope (you know I love a pattern with multiple views). Onward to sewing details. I happened to take a lot of photos while sewing this one - so this is for all of you who like to see the construction details up close :) That is the beauty of sewing a pattern repeat: no fitting, just sewing. First up - buttonholes. Well actually first up is cutting out, doing all the pattern markings with tailor's tacks, applying the interfacing and then it's time to get down to actual sewing. 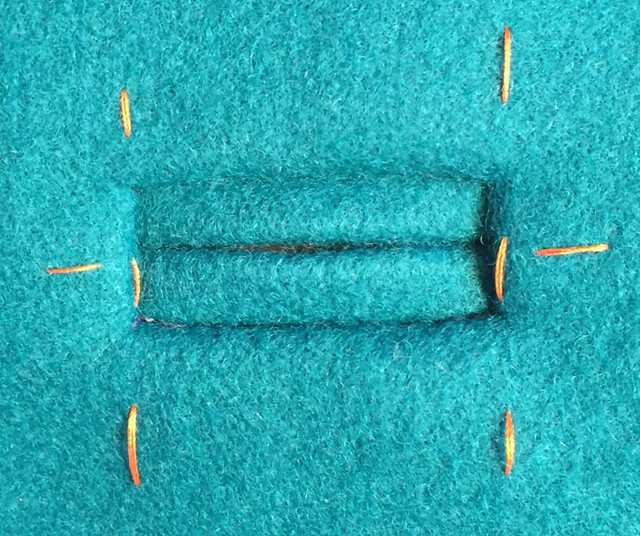 As you can see, I love being able to mark on the inside of coats or other wool garment that have interfacing, you can use a lead pencil and it is so easy to see. The dart in the top left corner is marked in pencil, actually connecting the dots of the tailor's tacks. Then I mark the placement of the buttonholes with pencil on the interfacing side. 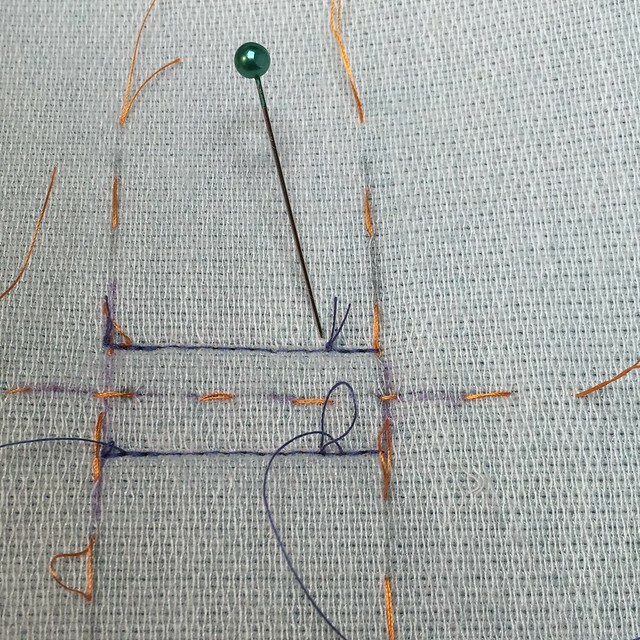 Then use silk thread to do a thread trace of the actual buttonhole. The vertical lines are just as important as the horizontal, as they keep the buttonholes in a line down the front of the garment. Next I place the buttonhole welts on the right side of the fabric. I tend to use 1/4" wide welts on thick coating fabric, mostly because they look proportional and also because I can't seem to make them any narrower in thick fabric like this. This is where the vertical lines come into play. 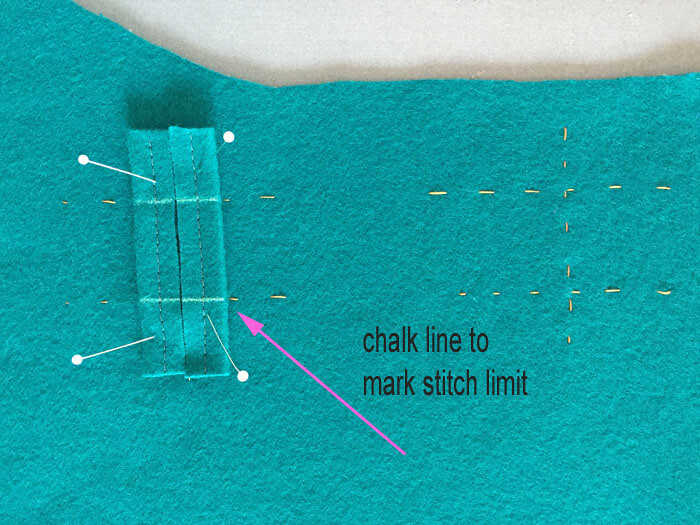 Using them I run a trace of chalk perpendicular to the stitch line, which tells me where to start and stop stitching. 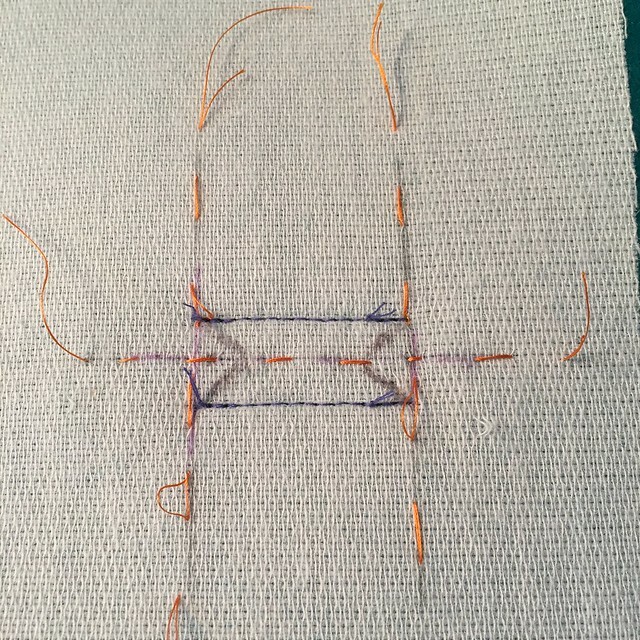 There it is, stitching in a purple-blue thread so I could actually see what I was doing. OH yes, make it easy on my eyeballs and use a thread shade just a bit different than your fabric for spots that are fussy and the stitching won't show - so much easier to see what is what. Gratuitous presser foot shot. Also - I count the stitches. WHAT? Yep I do. So the needle goes in, and I stitch forward 3, back 3, then forward counting until I get to the end, then back 3. And if all goes well than each buttonhole will be the exact number of stitches. Here is the backside of the buttonhole. Where I pull the threads to the wrong side and tie a knot. Necessary? I dunno. Just the way I was taught so I do it. Plus there are little sewing tasks that give pleasure, and for some reason I like to tie knots. In fact I have to keep myself from doing it in unnecessary places! OK, just a few more views of this buttonhole. And yes, I do draw the slice. Which I do with a sharp scissors - it is so important to get those little triangles the right size. As with any thick fabric it is a bit fiddly to flip the welts inside, but a good press and steam gets them nice and flat. All done! well almost. 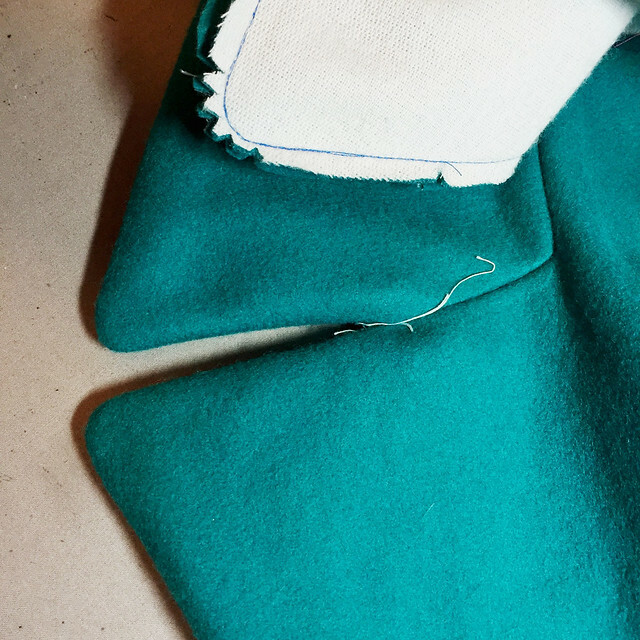 The facing isn't sewn on so that step where you attach the facings to the buttonhole is still to come but that is a lot later in the process. Onward to other parts of the coat. The two sides of this fabric seem indistinguishable but I don't want to risk it, so I mark all the wrong sides with tailors' wax chalk. Also I can't stand it when I can see the pocket lining on a side seam, it's one of those things that once I see it I can't look anywhere else and it spoils the garment for me. Ditto for novelty linings - I've seen lots of garments on blogs etc with printed or contrast linings and think, oh cute! But when I sew something, particularly a coat I want the lining to disappear. So I extend the pocket seam allowance at the pocket placement and then the pocket lining starts about 1" further into the pocket. That lining will never peek out. As for the inside of the buttonholes - jumping ahead in the construction, typically I would slice the facing open over the buttonhole. 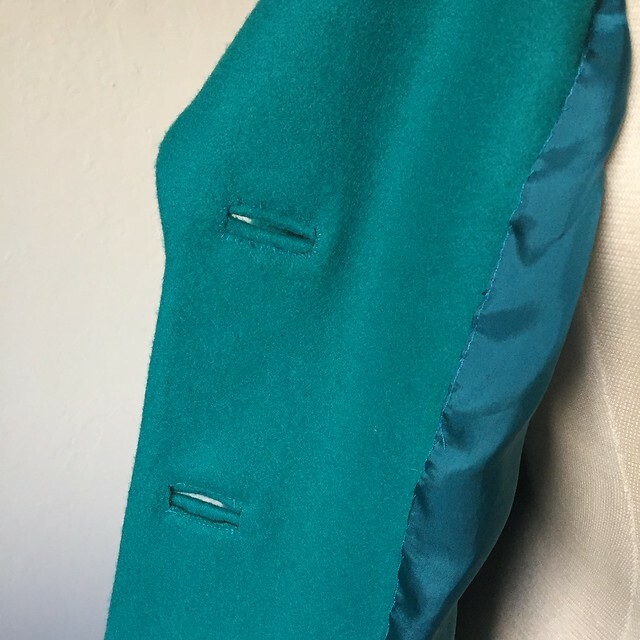 Yes I boldly slice (after basting the facing in a little square around the periphery of the buttonhole so it stays in place and oriented over the buttonhole exactly. And then just flip the fabric inside and hand stitch. Which was impossible in this thick fabric. So I hand stitched the first one and didn't really like the result. For numbers 2 and 3 I machine stitched in the ditch around the buttonhole and trimmed away the fabric. Much better. I should have done that with the first one but oh well. And defied my usual rule of making test and practice buttonholes. So not my neatest finish but workable and if anyone is close enough to examine my stitching I would probably give them a swift kick. Unless I invite you to scrutinize - which I probably would at some sewing meet-up where we all compare notes and details. By the way - the buttons I bought at Stone Mountain - my go-to spot for buttons. Aren't they a perfect match and just enough detail to add a little something extra to the coat. Next up, the collar and lapel. Which I will reserve for the subsequent post as this one is getting a bit long. By the way - even though I moan and groan about the end of summer and not liking the fall patterns, I have quite a few finished items so lots of blog posts for the rest of this year. And with some rain returning the weather is cooperating for some sitting down with my laptop and a cup of coffee. By the way - over the weekend I planted about 100 tulip and daffodil bulbs. As I do it I think "one for me and one for the squirrels" my garden nemesis! (nemeses?) anyway I hope to see them in springtime. The bulbs - not the squirrels. More to come on this coat, collar, lapels, extra interfacing, trimming. All the fun stuff. 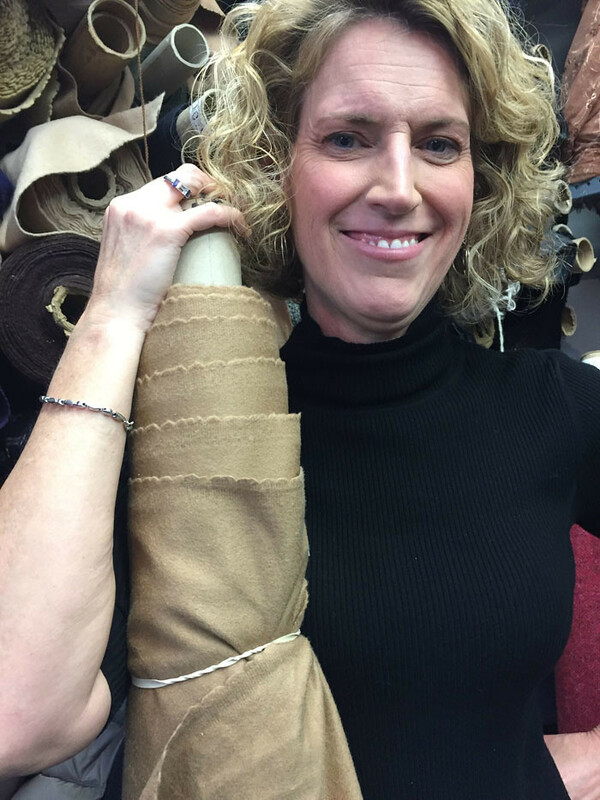 And my shipment from Kashi at Metro Textiles in New York arrived this week, so now I have to decide which of my latest fabric purchases I will start with. Happy almost Halloween sewing. I make a solemn vow each year never to enter Joann Fabrics the week prior to Halloween - it is downright scary in there with the costume sewers and the fleece. Oh the fleece - who buys it? what do they make? It is an avalanche of fleece. And most of it feels so plastic-y. Eek. Today's garden photo, despite the change in the weather still a few rose blooms struggling to appear. 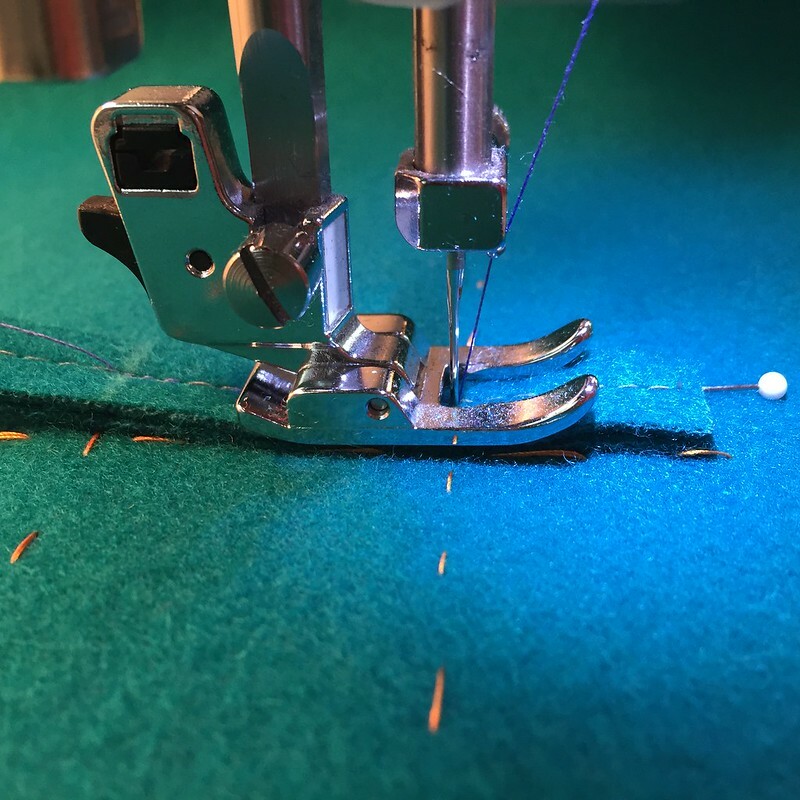 Many times I have written here that the very best part of writing a sewing blog has been the opportunity to meet other people who are as passionate about sewing as I am. 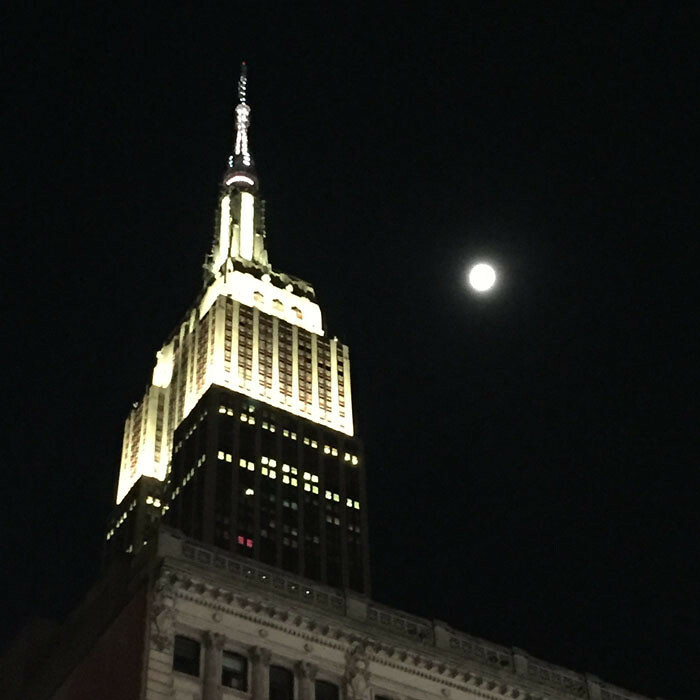 Last week was certainly proof of that, as I spent 5 days in New York socializing, shopping, meeting friends in person who had previously been online pals, and just soaking up the New York atmosphere. I've kind of had the bug to go to New York for a while, I've been there a few times to both visit friends and as a weekend stop added on to an east coast business trip. 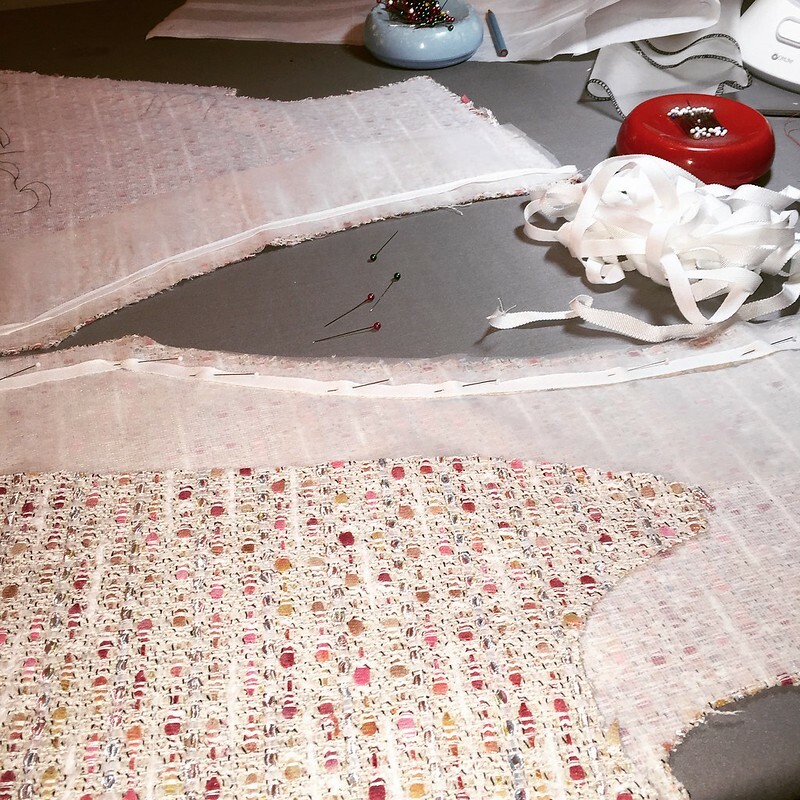 But now that I have been sewing since forever and blogging for 6 years I figured it was time to return. 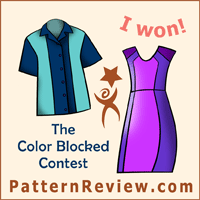 Plus I had a $ 100 gift card from Mood Fabrics burning a hole in my pocket for many months, since I won the Color-Blocking Contest on Pattern Review last December. My friend and neighbor Alice was my partner in crime on this adventure and we had a blast. 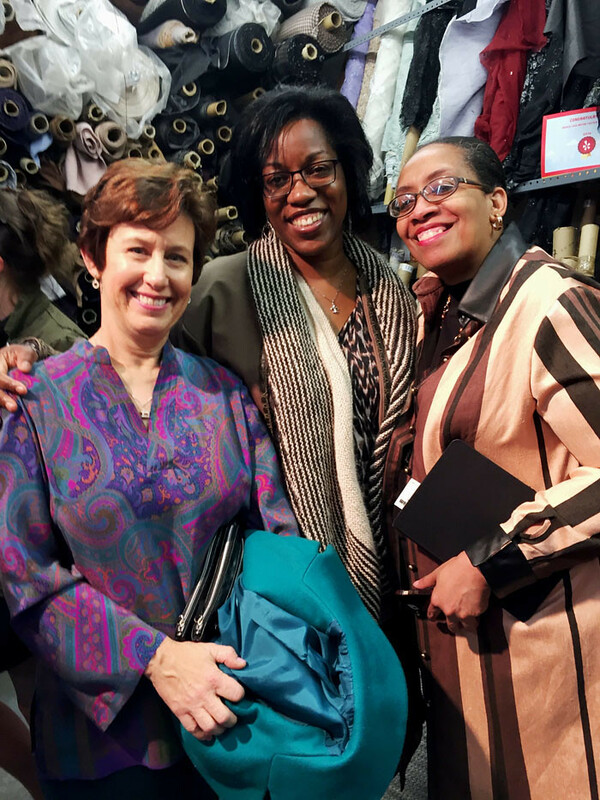 I definitely wanted to meet Carolyn of Diary of a Sewing Fanatic, and once I got in touch with her she she coordinated one of their periodic "wine and cheese with Kashi" sale events on Thursday night. Lucky for me that my visit coincided with that as it was a great chance to meet lots of people and do some fabric shopping as well. Back in 2014 Carolyn did a post on her top sewing blogs where she listed my blog as one she loved and learned from. I know I have so many readers from that post so it was so nice to meet her and say thanks in person for that. and even Rachel from London - that was an unexpected and happy surprise! I missed taking some other pics but after all we were there to shop as well! Carolyn has more pics on her blog post and if you are in the area she said she will be doing it again. 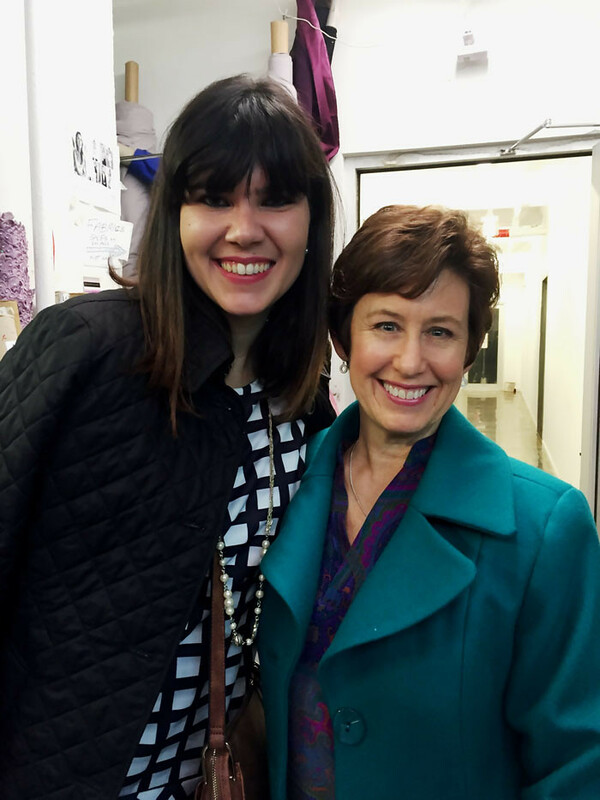 It is such a great way to support a fabric merchant who supports people who sew. I haven't shopped the garment district before but it does seem like I read about well loved stores closing which is sad. Alice bought more stuff there than I did - including this CASHMERE which is gorgeous! I will be sewing that up for her, making a sleeveless long coat (I guess technically a vest). And then we both bought a bunch of different fabrics for tops and shirts. Plus I got some beautiful red wool so I may just recreate the Vogue 1526 Paco jacket for myself. And a big thank you to everyone who said such nice things about my blog and my sewing. I appreciate it more than you can know! Earlier in the day we went to Mood Fabrics. 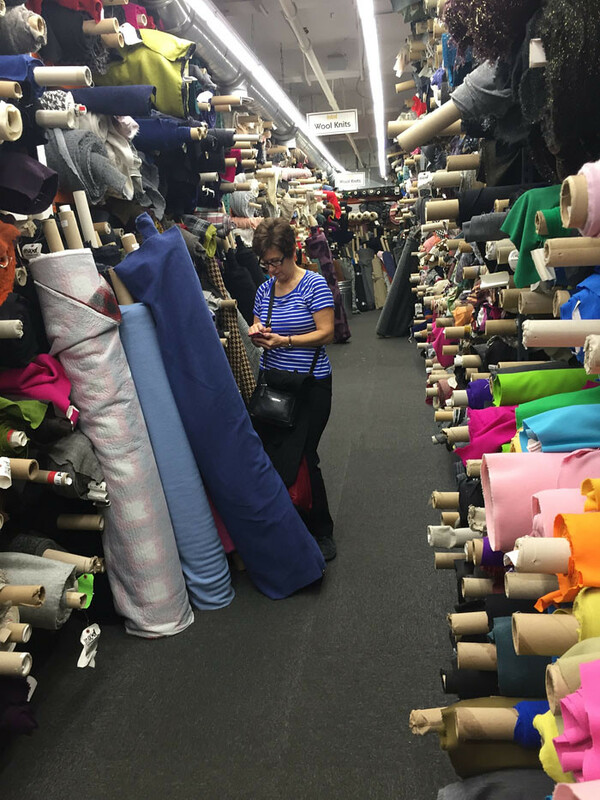 We are lucky to have some great fabric stores here in the SF bay area, but after all these years of watching Project Runway it was quite exciting to be there. I was actually impressed with the store - the selection of wools and silks is huge and the prices seemed reasonable to me. Here I am in deep concentration, texting to my friend Heather a photo of a blue wool jersey that I thought would be perfect for a dress for her. 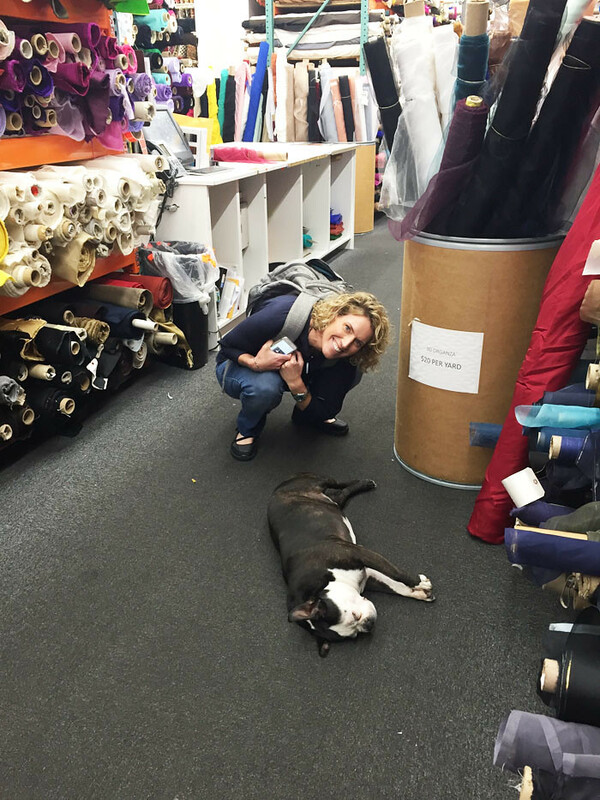 Of course Alice is a dog lover so she made a beeline to find Swatch. Who is exhibiting what I imagine is his typical behavior. The store was pretty empty on this Thursday morning so it was easy to wander through all the aisles and check everything out. 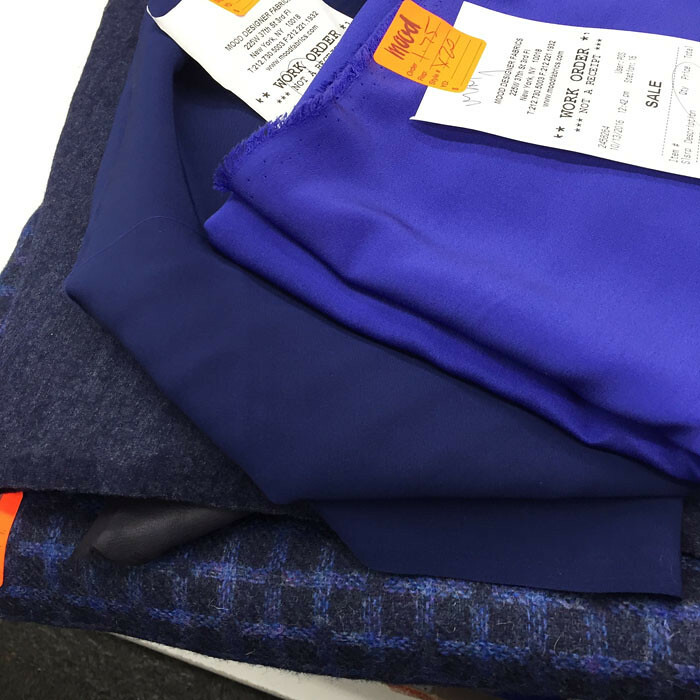 In the end I bought a lot of blue fabrics that coordinated, two different blue silks for blouses, a piece of blue leather, and the knit for Heather's dress. The wool plaid is actually different on either side, so I have to figure out what to use it for that will take advantage of that feature. The color in the picture above is more accurate, but this one below shows the two different sides of the wool. And then late on Saturday afternoon I just felt that I needed to go back to Mood - in case I missed anything :) A ponte knit stripe, and then two shirt weight cottons. Plus the design tape which I could not resist. (after seeing it so often on Project Runway). The rest of my trip involved walking, eating, walking, drinking, gelato eating, tapas eating, walking and some fun sightseeing thrown in for good measure. If someone told me I had to move to NY tomorrow I would find an apartment near Eataly - the big Italian food market and collection of restaurants across from the Flatiron building. So great and the nearest to real Italian pizza I have had in a long time. 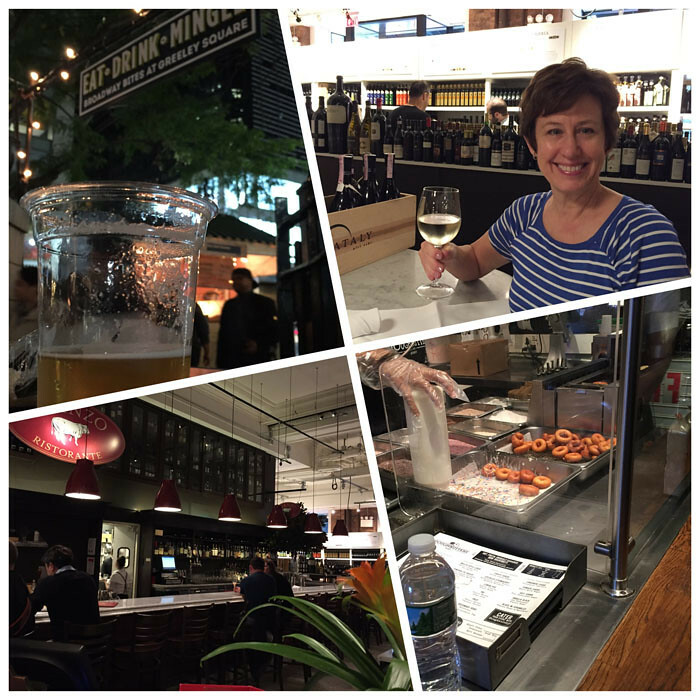 Also we checked out the Chelsea market, another great food destination. 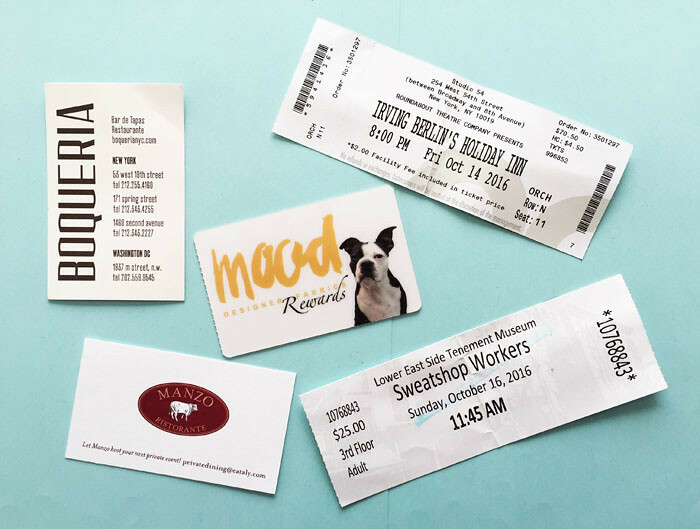 I always keep tickets and cards from restaurants, a small souvenir and a good way to recall locations and place names. couple of recommendations, Boqueria - a tapas restaurant in Soho, fantastic. Manzo, in the Eataly market, everything we ordered was great. The Tenement museum in the lower east side - super interesting, a museum in an old tenement apartment where they have recreated the historical living spaces of families who lived there in different eras. And to make it a real NY trip we saw a Broadway show. We bought tickets at the half-price ticket booth in Times Square to see Holiday Inn, which was really fun and gets you in the holiday spirit. I bet it will be really popular in December. One other interesting thing we did was walk the High Line - which is an old industrial elevated railroad track that has been converted to a park and walking path. We did the docent led tour which I liked as I always want to hear about the history and the guide was able to tell the history of the neighborhood and how it evolved over the century. I don't take a lot of pictures - tend to just absorb what I'm doing. 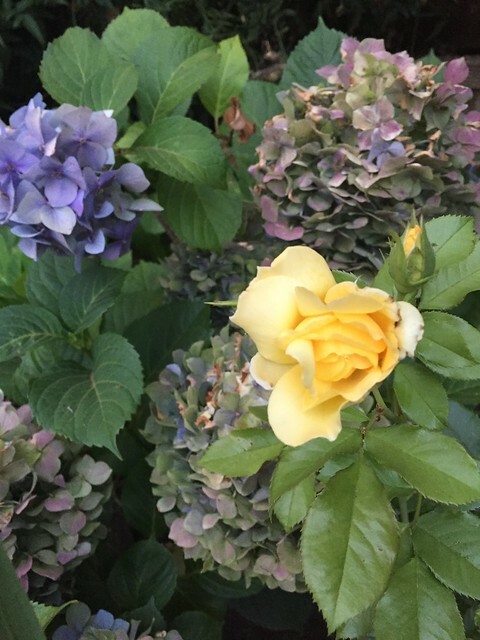 My pal Shams has recently been to NY and did a really great post including lots of pics of the High Line in the summertime so if you want to see more check out her post. 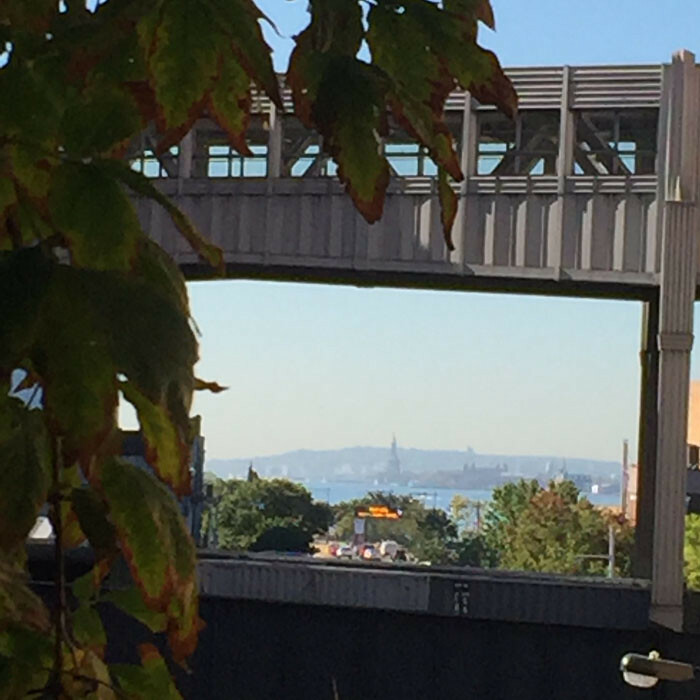 Yes, you can see the Statue of Liberty from the High Line - cool! 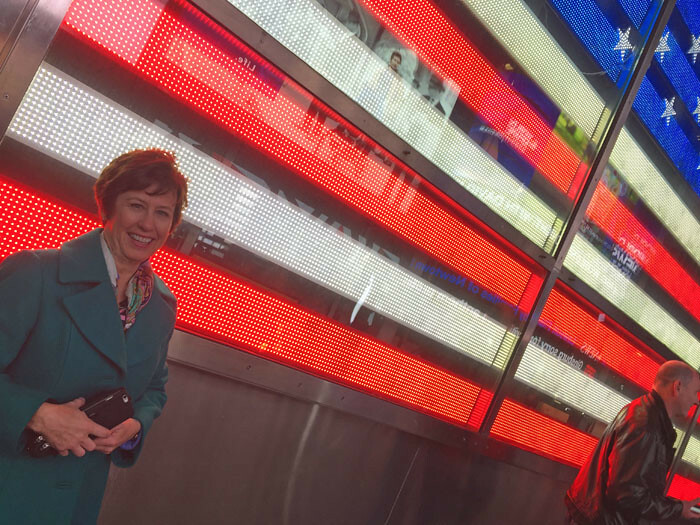 Times Square - here's a peek at my green jacket which I'm also wearing in some of the pics above - I posted this jacket on IG before I left on the trip. but a full post or two will be coming up here soon. 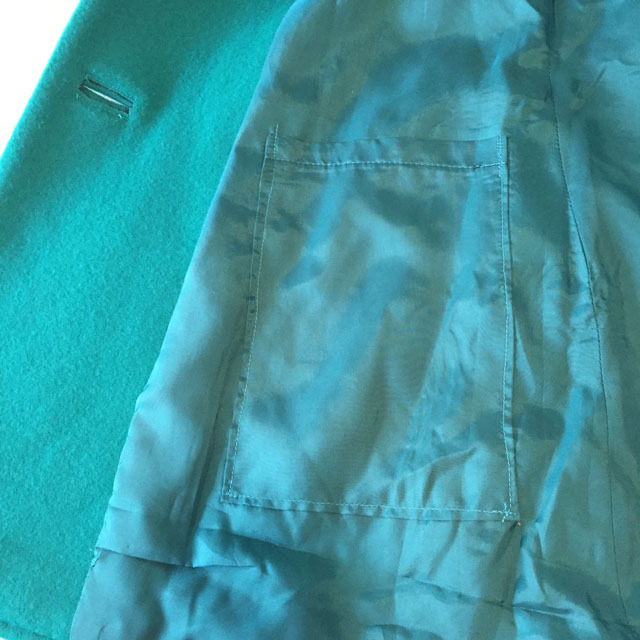 Do you recognize the green fabric? It is the rest of the yardage left after I made my Tricolor coat last December. This fabric is warm! And I needed it on this evening as there was definitely an autumn chill in the air. But otherwise it was beautiful weather, so lucky on that score. Goodbye New York - see you next year I hope. 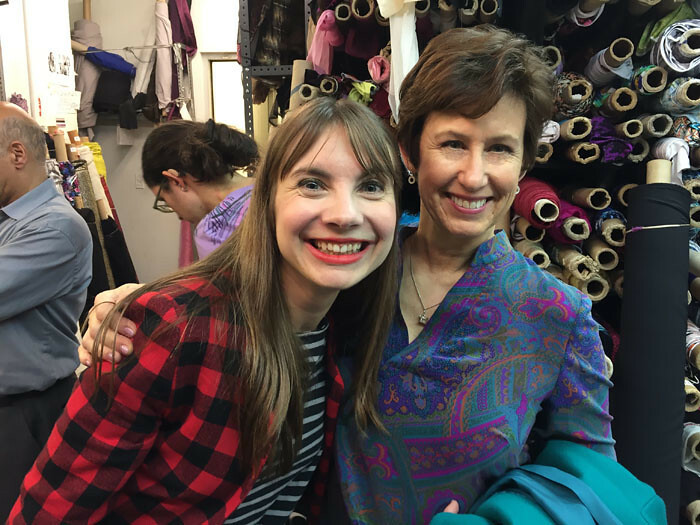 And all the sewing superstars that I met - it's so great to put a face to the name in the comments or meet someone who I have seen on Instagram. 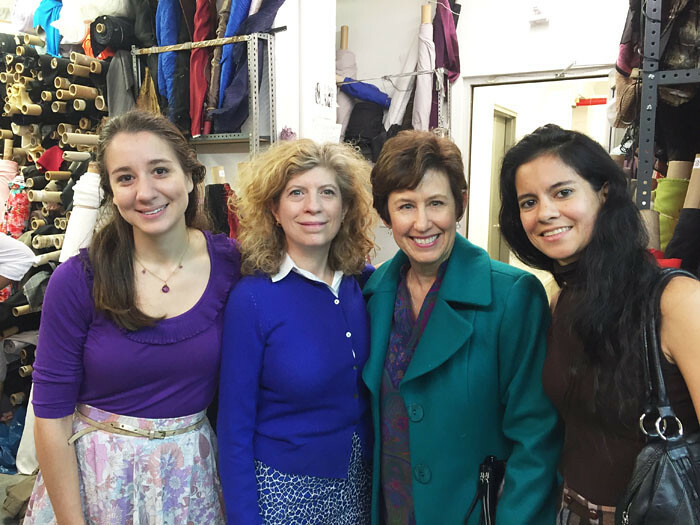 A few of you said you would love to take a hands-on jacket making class - I'll come back, let's do it! In other sewing news, I have a number of things completed and ready to post here, such as that silk top I'm wearing in the first picture, and a couple of dresses that just need some finishing touches. And then I can start on some of this new fabric - woo hoo! Here is something that took me quite a while to finish, and yet once it was finally basted together for final stitching I did breathe a sigh of relief, and appreciate this lovely fabric. My pal Heather bought this fabric at Mood during her summer 2015 trip to NY, where she did some solo shopping and came back with quite a few goodies. Some of which are still in my stack of "to do". In this case, she was quite willing to wait until my inspiration developed, although this one did say jacket when I pulled it out of the box. It said jacket - but I screamed, "Stripes!" OK - just between us sewing types, you know the feeling, when you are confronted with the fabric and kind of wish it was anything else. Like a nice, simple solid color! or random pattern that needs no special treatment! 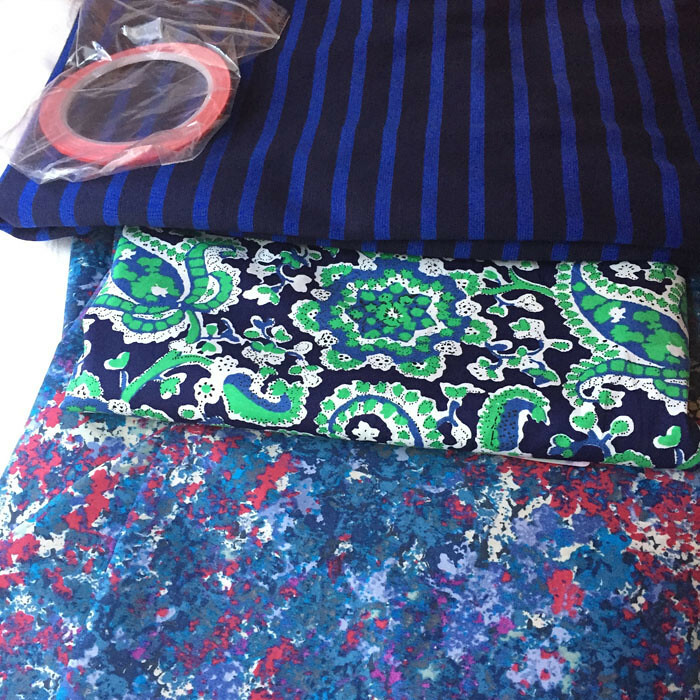 Of the various fabrics she bought on that trip (which includes some luscious silks waiting to be turned into a summer maxi) 3 of 6 were striped, or panels that need careful cutting. Oh well - text and FaceTime long distance shopping only goes so far. Enough about that. Like I said, she was in no hurry so slow and steady were the order of the day. 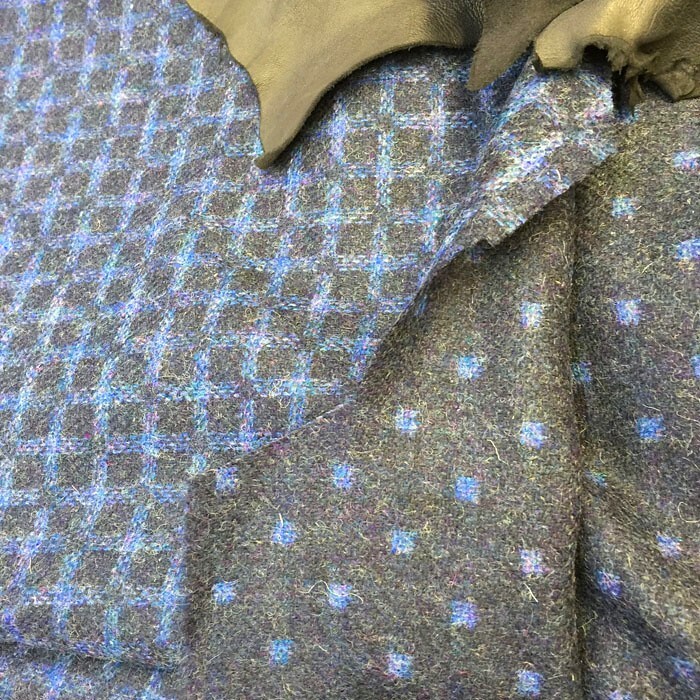 I have never sewn with a genuine Linton tweed but seen some samples that a friend ordered, and this very much reminded me of those. It is very loosely woven, actually a bit delicate, and the grayish stripes seem like satin ribbon or some kind of shimmery fiber. 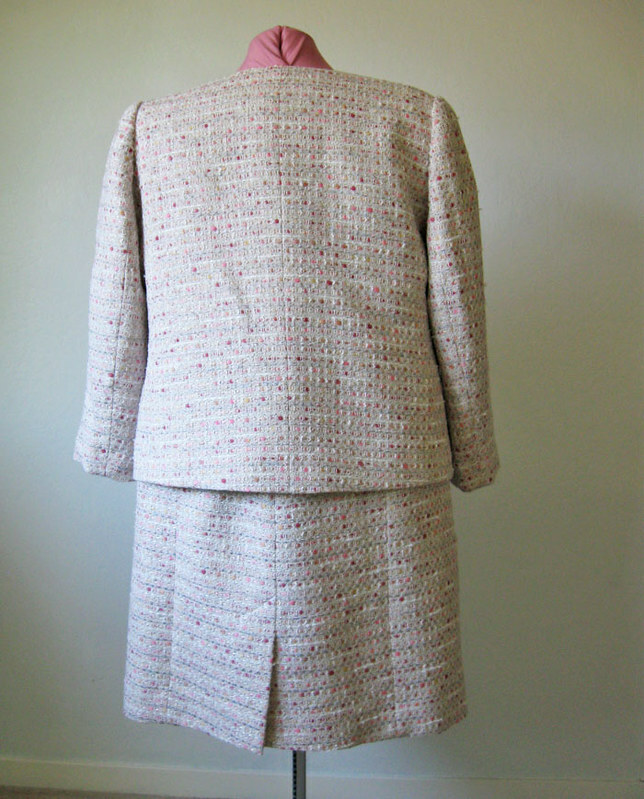 We had enough yardage to make a jacket and then a skirt but she is not really a skirt wearer - she prefers dresses so I suggested a jacket and then a dress with the boucle for the skirt and then a solid color on top. I had very little hope of finding something suitable and figured that might be tricky, but I walked into Stone Mountain Fabrics in Berkeley with my boucle swatch and they had a shelf of wool double knits - so this coral pick color was an absolutely perfect match and weight. Lucky score - or lucky me to have such a great fabric store so nearby. Here is the pattern I used for the jacket. I really liked this pattern as it combined some of the look of traditional jacket but has some nice features that make it work for a plus or full busted figure. Not sure if you can see it in the tech drawing but it has a princess seam down the front, and then a regular bust dart. I also like the open V neckline. The other version with the attached collar/lapel is also nice - might have to try that one now that I have all the fit changes worked out. And in a solid color! Because whew - the fitting was a bit tricky - in a solid you can do a little cheating with fit adjustments with with a horizontal stripe like this any change needs to be very exact and then also be accommodated to keep the stripes level and matching. Here's the dress, I only have this view on the dress form which is not really how it looks on, the fact that the top portion is a knit means that it fits very closely yet has plenty of ease. 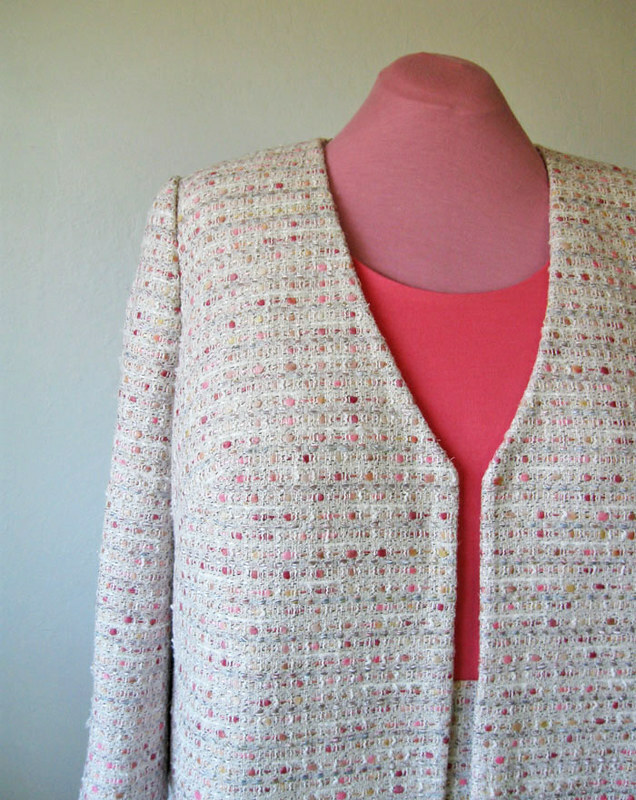 This wool double-knit is like a very thick ponte - I love this fabric and would use it again. Not that it is probably a lot warmer to wear than a rayon ponte - so keep that in mind if you try it. How about some sewing? Oh and by the way - this boucle is completely fused - every piece - with Pro-Weft Supreme lightweight woven fusible (this one). Why? 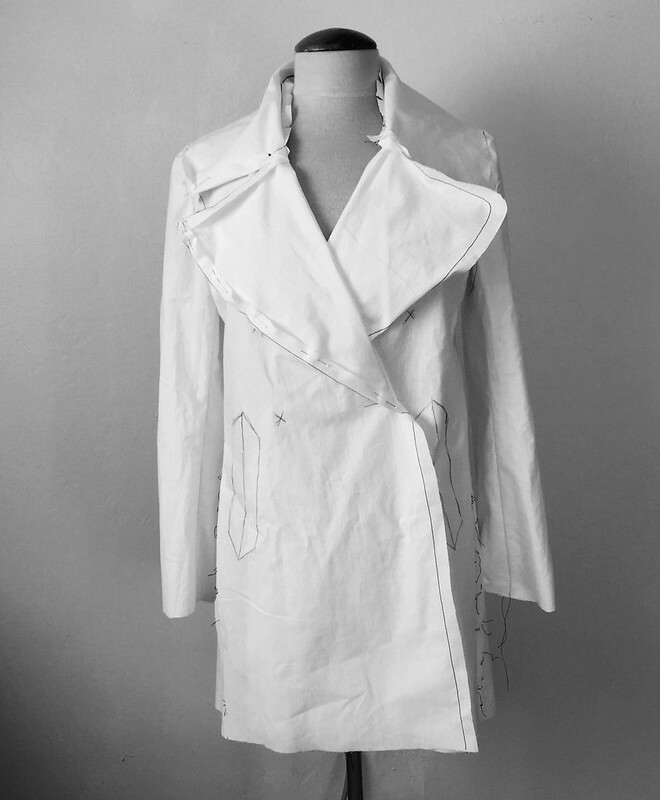 because I started with the jacket front, and had the jacket front stabilized with silk organza, and the edges taped. Then I put it on the dress form and it was just so limp. And with this open weave I didn't think it would survive much wearing. So I did some testing and liked the texture and drape with the fusible. 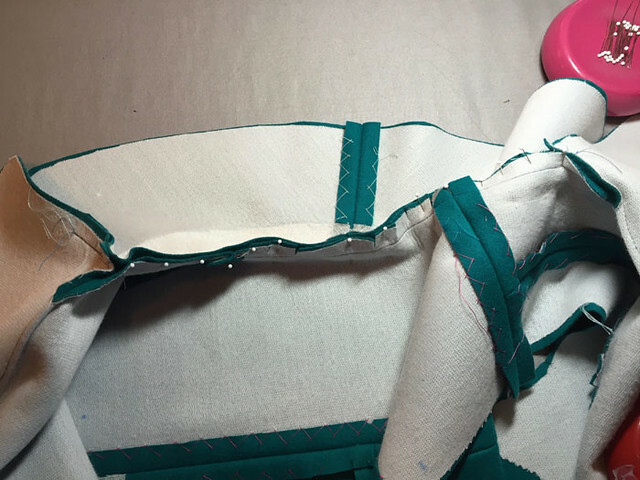 Particularly for the skirt pieces it seemed that they would need more than just lining, so fusible comes to the rescue. After that little hiccup I moved on to more fitting. 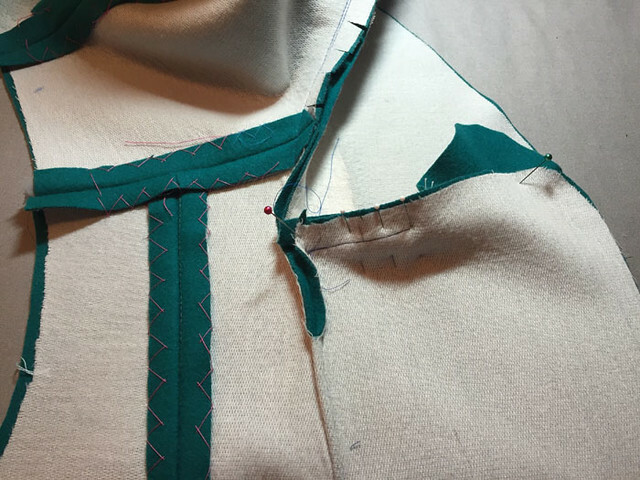 As usual, making the sleeve for a jacket where I have sliced and diced and adjusted the pattern a lot is then a bit tricky. I did use my trick of making a muslin test sleeve, fitting that into the real jacket, getting it to feel and fit just right and then cutting it out last. 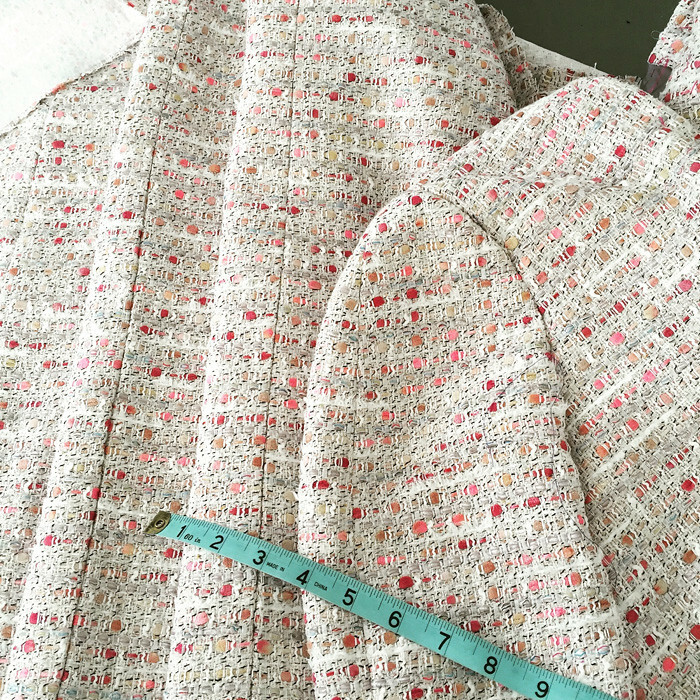 I even went so far as to mark the horizontal lines on the muslin so I could then place the pattern pieces on the boucle and have the sleeves match. Ok time to admit - this project was kind of agonizing. Check out that ravel-y fabric. Oh yes, this one wants to start disintegrating as soon as you touch it. 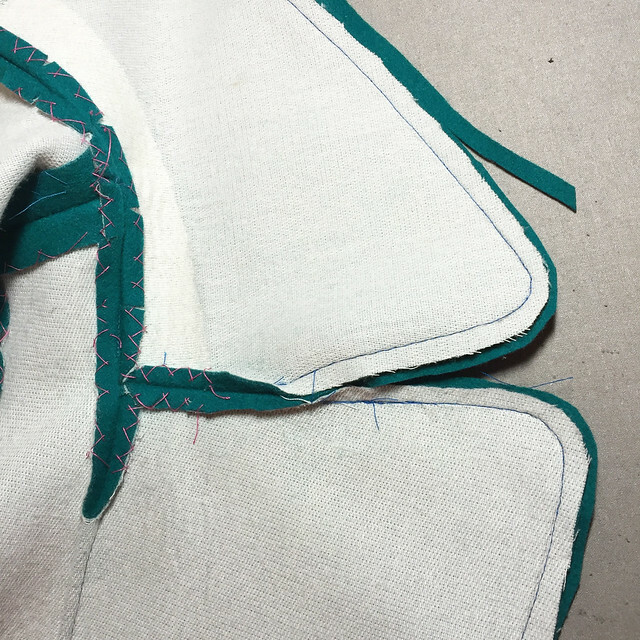 But once inside the lining it doesn't matter so no seam finishes, just healthy seam allowances, pressed down and sometimes catch-stitched so they stay in place. This is a really good view of the fabric and how loosely it is woven, it actually seems like a collection of ribbons woven together. And more of my thread traces to mark the hem edge. I had to bring out the neon green after I used all my other colors on various sections. Here is the result of all that persnickety matching - I was so satisfied if I do say so myself! This is one of those fabrics where it doesn't seem all that stripes - but if they weren't lined up it would be so jarring and look off kilter. So I'm glad I took my time on this one. The dress is a pattern I have used for Heather previously, it is a Bootstrap Fashion pattern that I ordered using her specific measurements, here's the link to the specific one I used. I've used this pattern twice for her, changing out the sleeves and then omitting the peplum thing. In this version I also omitted the waistband. With these patterns I've found the fit to definitely be in the ballpark. Depending on how much your figure is different from the standard on other sewing patterns (both in circumference and height) then these patterns are useful although not necessarily the answer to everything. I find they do have the right amount of ease (i.e. not too much) and the height measurements are amazingly good (length, where the bust and waist hit, etc) the fit in the bust can be problematic as you go up in size but the fit in the shoulders/neck is usually pretty good, so some more adjustment in the bust area seems like a reasonable thing to have to do for the rest of it to be more or less a good fit. I made a three piece sleeve as I needed to do some fit adjustments and this was the best way to get the shaping needed. More stripe matching! Also in this view you can see the bust dart. I believe I added length to the front and enlarged the dart a bit, then adjusting the side panel and back to match. I like the way the dart is angled, it really gives nice shaping but isn't an intrusive dart. What is an intrusive dart? one that I notice, like an arrow. I guess this is a style choice - there are a few indie patterns that I look at and all I can see is the dart placement (which looks wrong and too horizontal to me). So Burda seems to get this right pretty often. 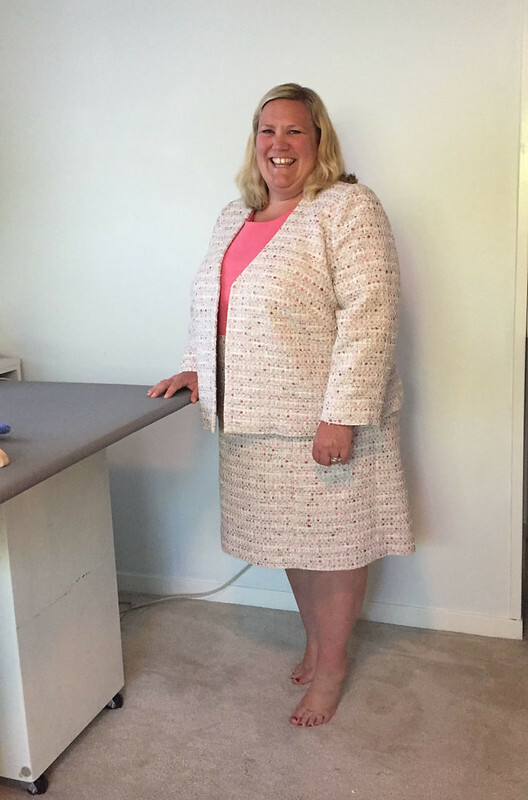 In fact I will say it again, for plus sizes I think Burda is such a winner - and with the envelope patterns or the downloadable pdfs I can find just about any style that I am looking for. Last look, the lining. I decided on a pale grey lining instead of a cream color. You know how an item with a white or light lining looks around the neckline after a few wearings - not my fav so a grey lining is a bit more practical. The bodice portion is lined in a coral pink. 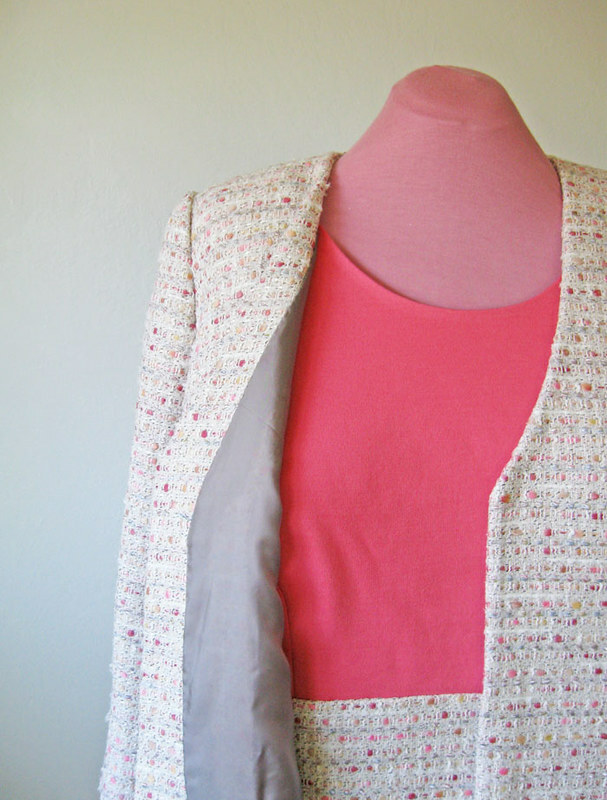 So that's the scoop on the epic boucle jacket project. 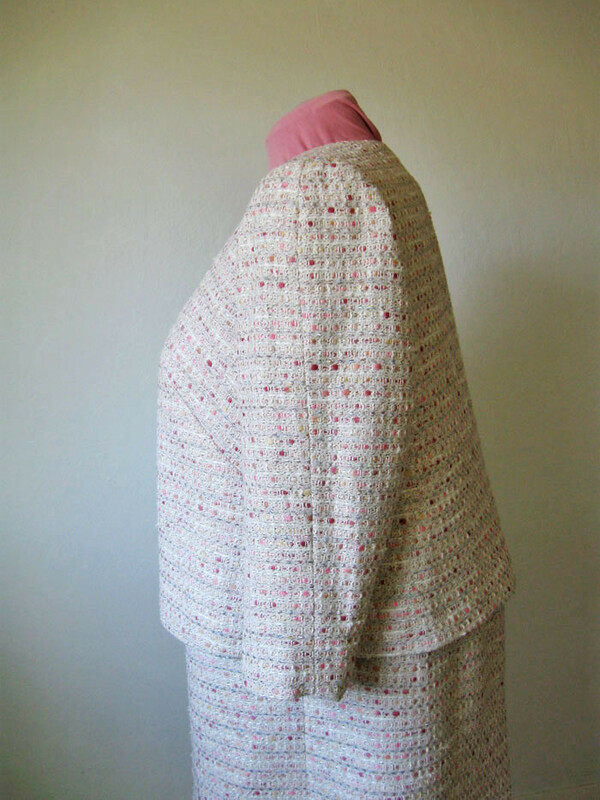 I have sewn so many things since I finished this and need to get going on my blog backlog. Life and travel keep getting in the way. Speaking of travel - did you see this Instagram post - read carefully :) and maybe I will see you there! Hope so! 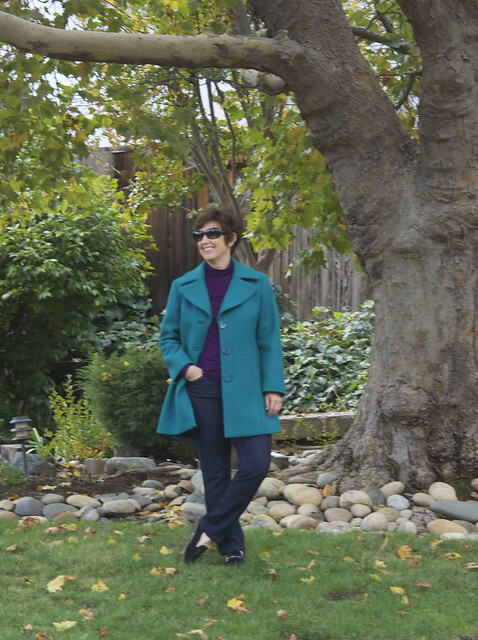 And I have even found my fall sewing mojo -despite our lingering summer weather. 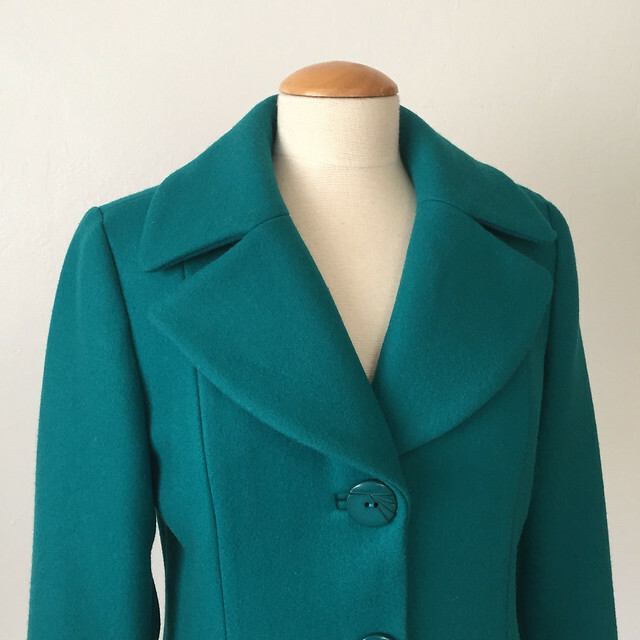 Sneak peek- I finished this to add to my ever growing stockpile of coats that I don't need but sew anyway because I love to. Blog post soon. And an interesting pattern journey that ended in a repeat. Today's garden photo - oh it is at a low ebb around here, just dry and nothing blooming and leaves piling up. 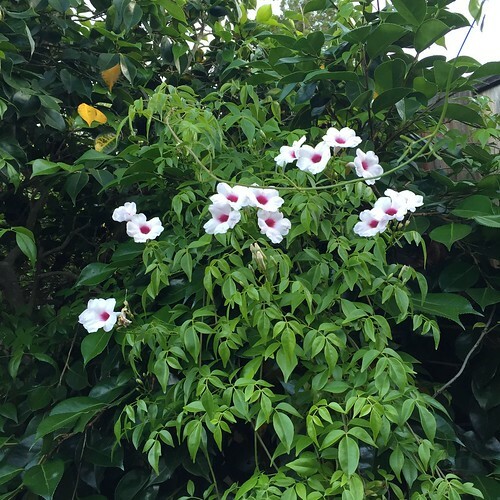 But this vine is a winner - I wish I had bought 3 when I found this at Home Depot a few years ago. Just keeps climbing the fence and blooming throughout the summer. Not flashy but dependable. Every garden needs lots of those.